The beauty of growing a little microgreen garden is that it’s so compact and convenient. The toughest part for us is remembering to water them everyday and to never let them dry out. We have forgotten about them before and had to start a new batch, but it wasn’t such a big deal. We like to re-use food containers to grow our microgreens. My favorite was a big, plastic birthday cake container from the grocery store. We used a lighter to burn holes in the bottom for drainage. It even came with a lid… perfect. 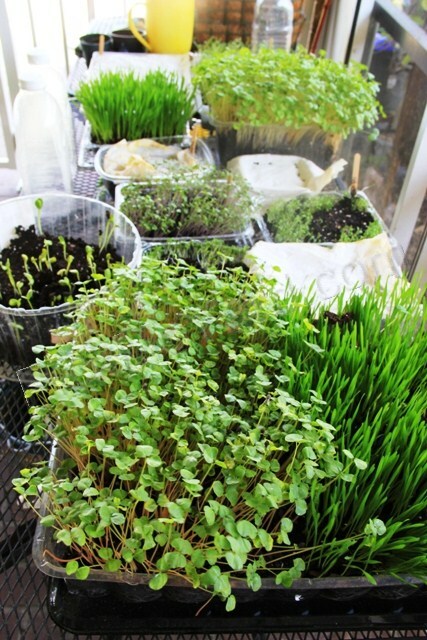 We’re amazed at how many food containers are ideal for growing our microgreens… trash to treasure. I can’t take credit for this idea though. It was sparked by You Grow Girl.com. That chick has some clever ideas. I think this container had lettuce in it. 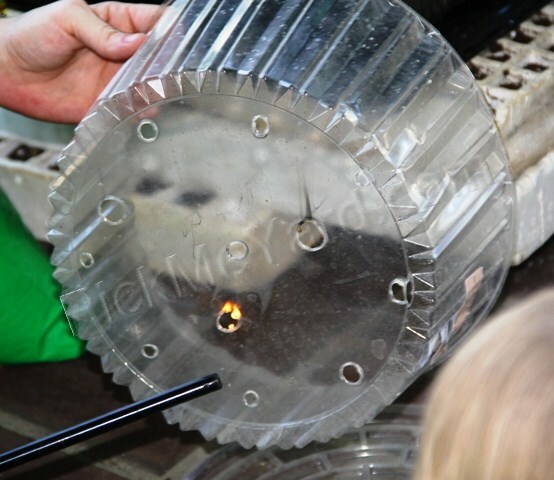 The plastic is thin which makes it easy to burn drainage holes in. Sometimes I use the lids as a base to catch drainage water. I keep a bucket of mixed potting soil with a cup on my porch all the time. It makes it convenient to start a new batch of microgreens. We only put a couple inches of soil into the containers. The first time we grew microgreens, we filled the soil to the top. 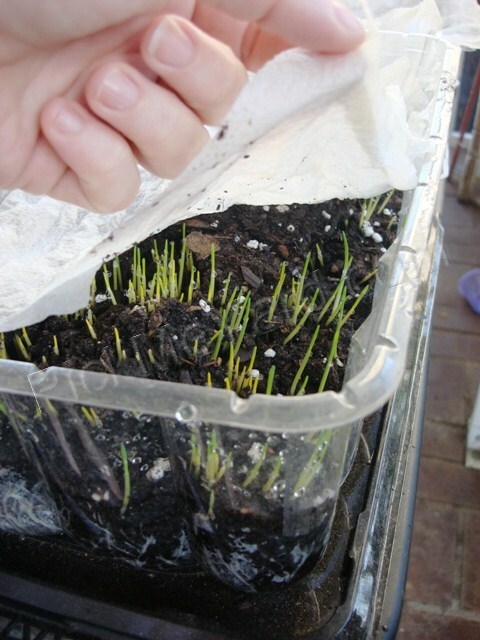 When the seeds germinated they pushed the soil right over the sides of the container. When we grow microgreens, we tend to use a lot of seeds. 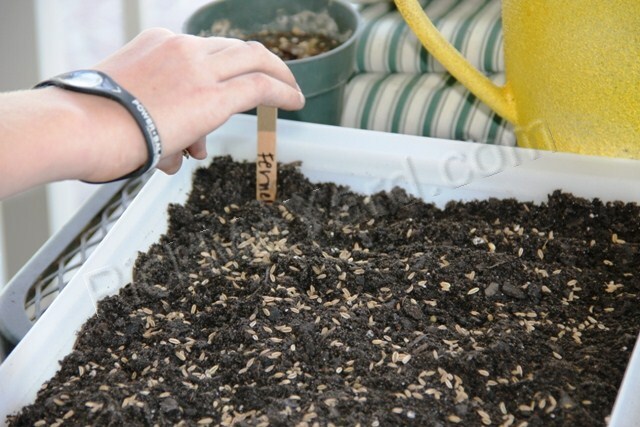 The seeds should be sprinkled generously over the top of the soil. I buy bulk seeds for growing microgreens since they usually have a better price. Oh, and some seeds should be soaked overnight for a better germination rate (chard and peas, for example). Also, keep in mind that each seed type will have a different growing ideal. Broccoli and purples cabbage are some of the easier micro greens to grow, whereas celery and basil could poise a challenge. We love to experiment, hate to follow instructions, and have a “just do it” attitude around here. We try to learn from our mistakes though. 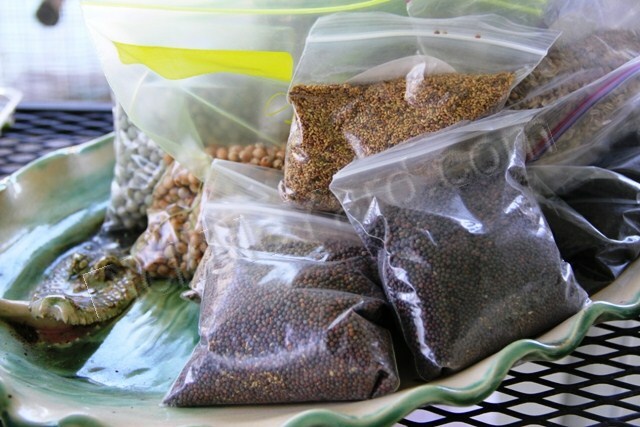 Bags of seeds for growing microgreens. After we’ve selected our container, half-filled with it soil and sprinkled our seeds, we cover each container with a paper towel. The paper towel should not be removed until the microgreens push it up with their growth. The paper towel should not stick to them at this point. Don’t be too hasty to pull the towel off or you could pull your microgreens out with it. We like to lift up a corner of the towel and peek underneath to see how they’re doing. 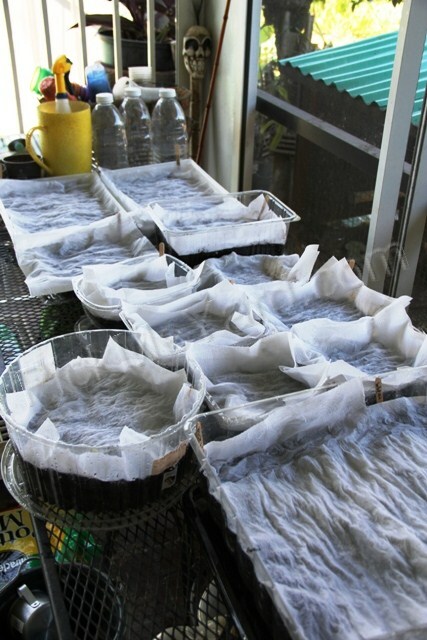 Microgreens trays covered with paper towels. We water right over the towels. It keeps everything in tact and helps the seeds germinate. The seeds do not need light to germinate, but they do need water and warmth. Are they ready yet? Nope, not yet. They can’t be allowed to dry out. I made a watering canister out of an old juice container by drilling holes in the lid. It delivers the water like a rain shower. More trash to treasure. 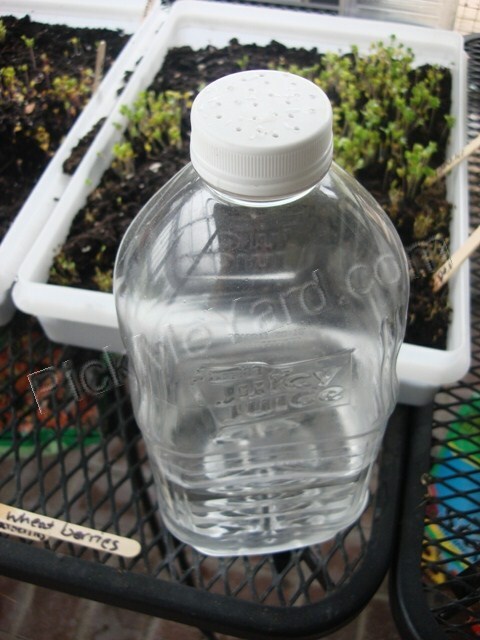 This juice container was saved from the landfill and makes the perfect microgreen waterer. Grayson spreading his favorite seeds... fennel. How could this not be packed full of nutrients? Beautiful, non-toxic and chemical free greens grown in our rich little garden… rich with life! We’re in love with microgreens. They make the perfect urban, mini-garden. I think you should fall in love with them too. Oh please, please let me tell you why. Don’t let your eyeballs glaze over… this is good stuff. 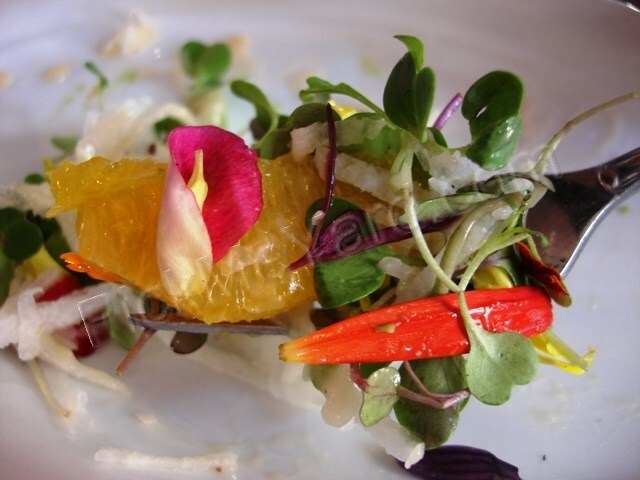 Are you wondering what microgreens are? Sprouts? Baby greens? They’re not either. 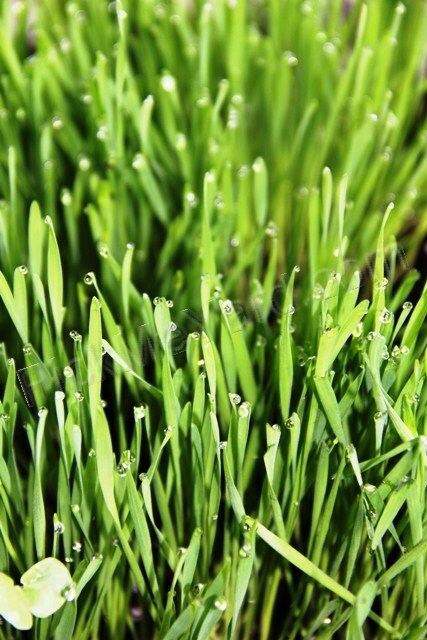 Microgreens are the stage of growth when a plant develops its first leaves, after the seed sprouts. If the microgreen is not harvested, then it grows into the baby green stage. The microgreen is a treasure trove of nutrients. I don’t have a nutritional analysis on this though, only logic. For further reading, there is a fabulous book called Microgreens by Eric Franks & Jasmine Richardson. Microgreens look beautiful, taste like heaven, and have health benefits. They’re full of flavor and I don’t have to chew and crunch like I’m eating a salad. They do actually melt in your mouth. 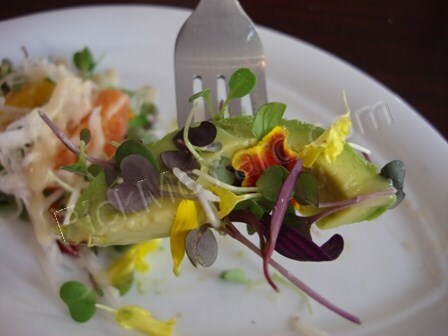 A bite of avocado with microgreens, shredded jicama, and a miso dressing. However, the best part is they are incredibly easy and fast to grow. I love the little garden look on my indoor patio. Our favorite microgreens are fennel (tastes like licorice), basil, alfalfa, wheat berries, peas, amaranth, kohlrabi, celery, onion, beets (they’re red), sunflowers, red clover… but there are many, many more that we haven’t tried yet. 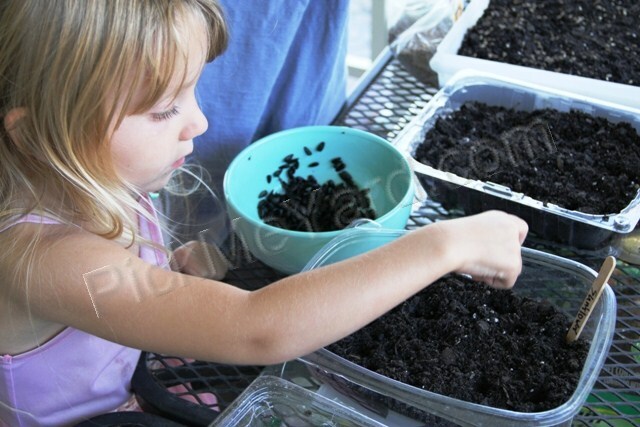 My children love to grow microgreens in the summer because there are no weeds, no insects and no hot sun. It’s not possible for us to grow lettuce (and a lot of other stuff) in our Southwest Florida heat and humidity (during the summer) because the elements are just too extreme. Our microgreen garden, on the patio or in the kitchen, makes up for this. We can have our cake garden and eat it too. 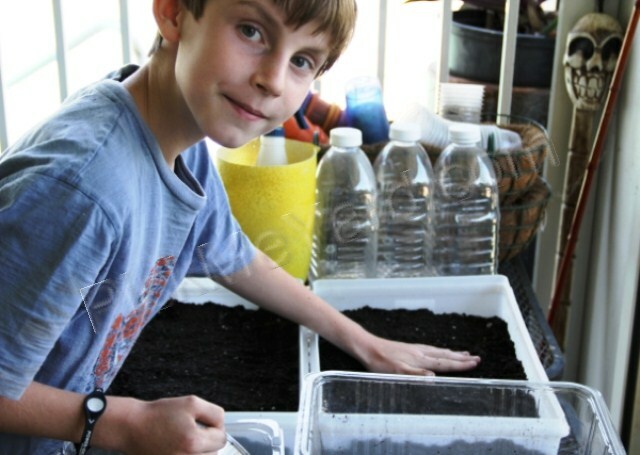 Loring planting the seeds in our microgreen garden. Have I talked you into growing some? I’m trying really hard. 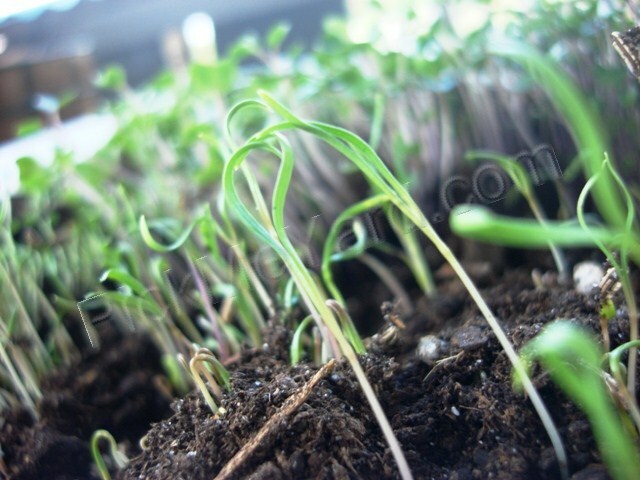 In my next post, I’ll share a really easy and inexpensive way to grow them. 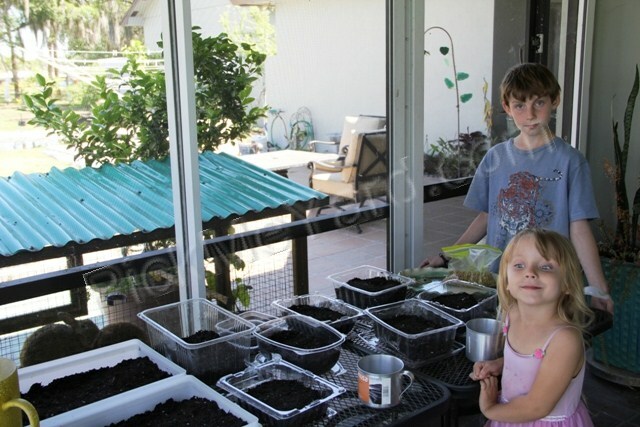 We’ve been growing crops in recyclable containers on our lanai and in our kitchen. 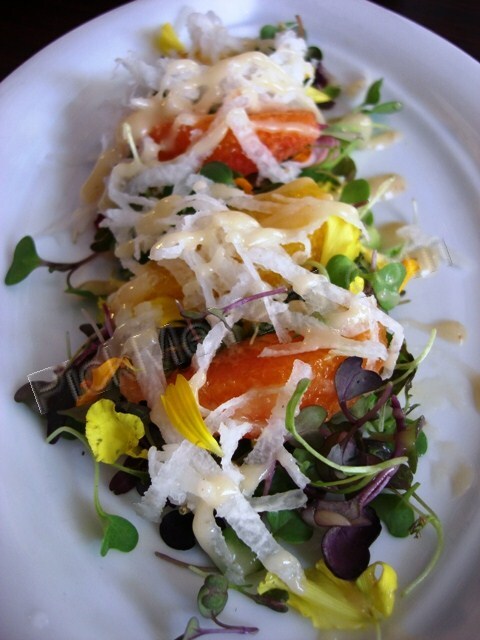 Grapefruit with microgreens and edible flowers. Delicious! Our wheat berry microgreens with water droplets on them.